Don't you just hate it when you run out of ink or toner for your printer? With a Toner Giant voucher you can stay stocked up on all the essentials without spending a fortune. Whether you're a small business looking to keep your office printers supplied with everything they need or an individual wanting the best deals on ink and toner for your home printer, a Toner Giant voucher code will save you money while you shop. We all know how exasperating it is when that dreaded 'ink level low' reminder pops up – especially as it always seems to be when we have important documents or tickets to print out. Make sure you're never caught out again with a visit to Toner Giant. Founded in 2006, Toner Giant is a dedicated online store selling toner and ink for your home and office printers. Toner Giant stocks products that are compatible with almost every major technology brand, including HP, Samsung, Brother, Epson, Canon, Lexmark and more. All you need to do is visit their simple-to-use website and choose the brand, make and model of your printer to see great deals on inks, toners and more. The company stocks standard ink and toner as well as solid ink for Xerox machines and franking ink cartridges and labels. Need paper for your printer? At Toner Giant you'll find a wide selection available to purchase, whether you want high quality photo paper for printing out your digital images or inkjet paper for everyday use. You'll also find a range of speciality paper such as arts and craft paper, carbonless paper, proofing paper, thermal paper and transparent paper. Toner Giant isn't just about printer accessories either – the website also boasts a comprehensive stationery department packed full of everything you need for an efficient workspace in your home or office. Get great deals on everything from lever arch files and notepads to ball point pens, post it notes, staplers and much more. You can even use the website to purchase a brand new printer from Toner Giant – take your pick from the latest models from some of the world's top brand. Choose from basic budget models ideal for use in the home to top-of-the-range colour laser printers capable of professional-quality print runs. Want to get shopping with Toner Giant? With a Toner Giant voucher you can enjoy fantastic savings on their wide range of printers and accessories. Whether you just need a new ink cartridge for your home printer or you want to bulk buy toner for your office, a Toner Giant voucher code is a great way to save the pennies. Browse our website until you find a Toner Giant voucher that suits you, then navigate to their website to begin shopping. Enter your Toner Giant voucher code in the box provided and click 'Apply'. If you've enjoyed shopping with Toner Giant, you might also like to check out more great deals on similar products with The Cartridge People or Cartridge Monkey. Or, if those aren't right for you, you'll find plenty more stores to browse in our Office Supplies section. Category Office Supplies offers you a wide selection of coupons and rabates. If you haven't found any vouchers for Amazon UK, check out the bargains at Cartridge Monkey. Enter your Toner Giant voucher in the box provided and click 'Apply'. Enter your email address and click 'Continue'. Enter your details and click 'Continue to payment'. Enter your payment details and click 'Place order' to complete your purchase. Next day courier delivery is free on all orders. If you need to return a product for any reason to Toner Giant, you can do so by simply contacting the company for further instructions. Need to contact the team at Toner Giant? Whether you have a question about your order, want to know which printer or toner is right for your machine or simply want to find out how you could make big savings with a Toner Giant voucher code, you can contact the Customer Services department by telephoning 0845 365 3605. Want to find out more about what's happening at Toner Giant? The company maintains a profile across all your favourite social media networks. Follow them for lots of exclusive content including competitions, promotions, help videos and more. You can also use these pages to find out more about saving money with a Toner Giant voucher. Don’t forget to check them regularly, as you can never be sure when a free Toner Giant voucher code might be waiting for you! Buy now online at www.tonergiant.co.uk. When I first started my home business I had no idea how much I would spend on printer ink alone! Thankfully I found a Toner Giant voucher code online. 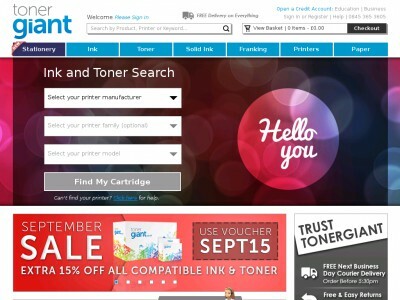 Tonergiant.co.uk has a fantastic selection of cartridges as well as printers, paper and stationery – all available at a discount with a Toner Giant electronic code. I managed to get well stocked up for the months ahead without spending a fortune simply by entering my Toner Giant voucher at the checkout. So if you want to make big savings on your office supplies, check out the latest Toner Giant discount code.